Today was my student, X’s, second lesson in handling a long pole. I am moving him beyond the initial 2 movements of splitting and thrusting. The first two movements are important in laying the basics of postural definition, how to hold the pole, fundamental striking power, etc. 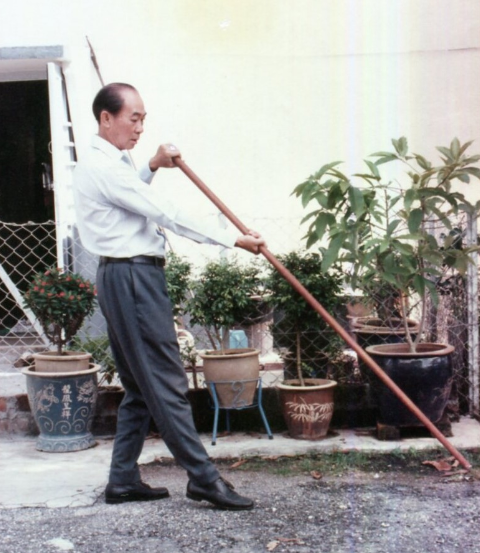 However, today we moved on to learning how to do simple defending movements such as Leaking Water Pole (demonstrated by Master Leong Lin Heng below) with forceful power. I worked with X to develop correct body positioning, timing of movements, how to change from one posture to the next and so on by feeding him attacks slowly so that he can practice properly. Learning the long pole will test X’s mastery of the basic principles from the Yang style and Wu style long forms with their respective characteristics. The Yang style should enable X to move the pole fluidly whereas the Wu style long form should enable him to generate forceful power using tight motions. In turn, the long pole will teach X to redefine his empty hand movements to move more economically and efficiently without sacrificing power. The long pole is actually a much easier weapon to learn than the straight sword. As X was unfamiliar with handling a pole it was still not a walk in the park for him. He struggled with getting his body into the correct postural construct and was using too much strength such that the pole ended up wobbling. Such wobbling might have looked powerful but the power was not coming through to the part of the pole that was used for hitting. So when I fed him attacks to practice against he could not knock me off my line even though I was not holding my pole firmly. A good pole movement should be fluid, swift, forceful and unpredictable. In this way when the pole encounters the opponent’s weapon it will knock it way off position and before the opponent can recover the pole will be brought in to swiftly end the fight. Striking each other’s pole is what we do in practice to avoid injury. In actual usage the techniques of the pole will be performed slightly differently to make the attacking and defending techniques even more direct and devastating. I let X felt what it was like to be struck by a pole thrust by placing the tip against his body and applying a slight force to move him back a few feet. In this way he can feel some pain but without being injured. In practicing the issuance of power we gauge the power of the strike by feeling the resultant vibration that is generated when pole is struck against pole. A strong shocking power applied to the opponent’s weapon holding wrist will instantly result in a fracture or a concussion if used in a splitting strike to the top of the head. Learning the long pole can help accelerate our ability to Master Tai Chi Today. There are other things we can learn through the pole form also but its another story for another time. This entry was posted in Form, Learning, Nip Chee Fei, Practice, Student-Notes, Weaponry and tagged longpole, nipcheefei, singaporetaichi, taichi, taichisingapore, taiji, taijiquan, yang style by Mushin. Bookmark the permalink.